Alice Cooper put on a horror show. On his records, though, the music emphasized show, not horror. 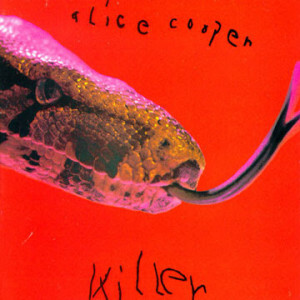 Of Killer‘s eight tracks, only one song could be properly defined as shock rock, and it happens to be the most somber track: “Dead Babies.” The rest of the album is a genre travelogue — the old West, the spy movie, the multi-storied land of being a rock star and getting chicks, while occasionally running them over in your car. First and foremost, Alice Cooper was a hard rock band. The twin guitar attack of Buxton and Bruce could go on long psychedelic tangents. On Killer, they pare everything down. Their tightness and simplicity make Killer eternally accessible, even in the eight-minute King Crimson-like “Halo of Flies.” These songs could be the first thing you learn when you get your electric, but would remain a blast to play even after you’d gotten kinda good. All of which leaves more room for Vincent Furnier to imbue the music with an incredibly strong sense of persona. Alice Cooper is a ringmaster, constantly in charge. He’s the one who gets her under his wheels. He’s the spymaster that had to destroy the middle Asian lady and plant a time bomb in your submarine. He’s the Desperado. That’s one of the dirty little secrets about Alice Cooper. He (and they, since this early album was very much a band effort, some songs written entirely without Alice/Vincent) liked to say they were the stake through the heart of the love generation. The notion goes deeper than just playing music that was intended for Budweiser and Swank, not LSD and free love. Killer deals, again and again, with consequence, judgment and punishment. Alice’s bad guys aren’t good guys. He’s anti-them; they’re not anti-heroes. This is Alice Cooper seeing what you’ve done, and letting you know you’re not going to get away with it.